Starring Charlton Heston, Yul Brynner, Anne Baxter, Edward G. Robinson, Yvonne De Carlo and directed by Cecil B. DeMille. To escape the edict of Egypt's Pharoah, Rameses I, condemning all first-born Hebrew males, the infant Moses is set adrift on the Nile in a reed basket. Saved by the pharaoh's daughter Bithiah, he is adopted by her and brought up in the court of her brother, Pharaoh Seti. Moses gains Seti's favor and the love of the throne princess Nefertiri, as well as the hatred of Seti's son, Rameses. When his Hebrew heritage is revealed, Moses is cast out of Egypt, and makes his way across the desert where he marries, has a son and is commanded by God to return to Egypt to free the Hebrews from slavery. In Egypt Moses's fiercest enemy proves to be not Rameses, but someone near to him who can harden his heart. Starring Theodore Roberts, Charles de Rochefort, Estelle Taylor, Julia Faye, James Neill and directed by Cecil B. DeMille. The first part tells the story of Moses leading the Jews from Egypt to the Promised Land, his receipt of the tablets and the worship of the golden calf. 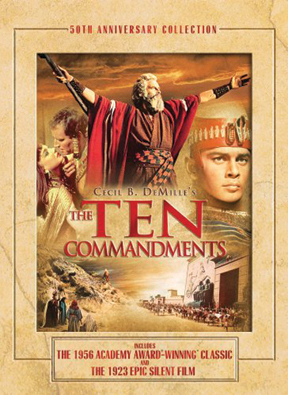 The second part shows the efficacy of the commandments in modern life through a story set in San Francisco. Two brothers, rivals for the love of Mary, also come into conflict when John discovers Dan used shoddy materials to construct a cathedral.